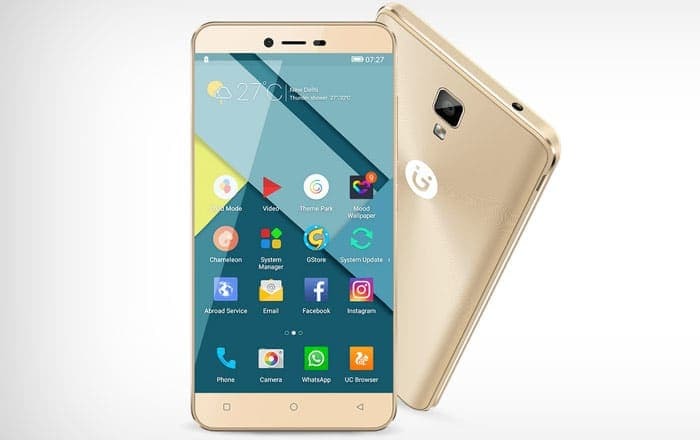 Adding to its ‘P series’, Gionee has unveiled P7 smartphone in India priced at Rs. 9,999. The device flaunting metal edges features a 5-inch (720 x 1280 pixels) HD IPS display with soda lime protection. Powered by a 1.3 GHz quad-core processor it is coupled with 2 GB of RAM. On offer is 16 GB of inbuilt storage expandable with a microSD card slot (up to 128 GB). The smartphone runs on Android 6.0 Marshmallow based on Amigo 3.2 supporting dual-SIM slots. It further houses a 2300 mAh battery which claims to last up to 259 hours of standby time. Connectivity options include 3.5 mm audio jack, FM radio, 4G VoLTE, Wi-Fi 802.11 b/g/n, Bluetooth 4.0 , and GPS. The photography options comprise of an 8-megapixel rear camera with LED flash, and a 5-megapixel front shooter for selfies and video chats. The phone supporting VoLTE and CDMA options also sports a ‘back arc’ making it more comfortable to hold. There is also apparently a transparent, glittering ‘3D Mirror’ with ripple effect pattern on the back. Gionee P7 will be available in White, Latte Gold, and Grey color variants across major online and retail stores in the country starting 12 December.